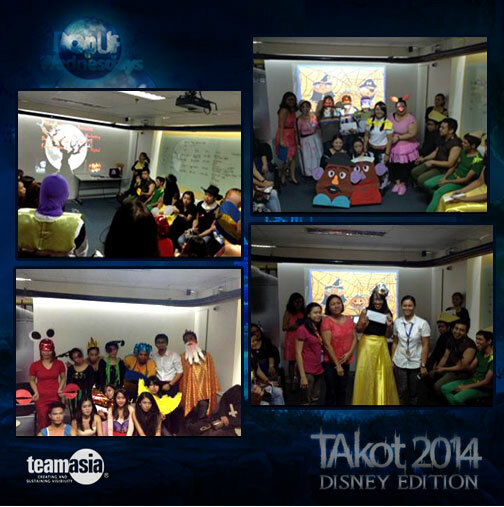 Pop Up Wednesday’s TAkot 2014: Disney Edition – Read about anything and everything TeamAsia in this little nook of ours! Every last wednesday of the month, a surprise pops up for all the bright and shiny people of TeamAsia—jenga competitions, pampering sessions, pizza parties, and community service opportunities, just to name a few. Last month was October, so of course, we had our yearly halloween costume and decorating contest. And boy, was it as competitive as ever! Each area of the office picked out a Disney theme from the lot of Snow White, Frozen, Sleeping Beauty, Hercules, Peter Pan and Toy Story. To impress our lovely friends from Infosys to judge the contest, each department took every free time possible during the week to prepare their areas and costumes. Taking home the first prize for the second year in a row was the content team–composed of the Public Relations, Media Relations, Editorial and Digital groups. Judged by 40% theme interpretation, 40% spook effect and 20% costumes the Content department, did what they do best, and that’s creating a story to tie up all these elements for a maximum spooktacular experience for our guest judges! The telemarketing team took second place for their spine-tingling take on Toy Story, while the Executive Office’s gory retelling of Snow White helped them bag the third slot. Be sure to check back regularly for more updates about the amazing things we do here in TeamAsia.